Content Marketing is quickly becoming an essential part of the marketing strategy of every B2B company. It allows you to engage with your customers and prospects at each stage of their buyer journey. Even when they don't want to speak directly with you, Content Marketing can ensure customers the receive appropriate messages as they research, assess and decide on their purchase. 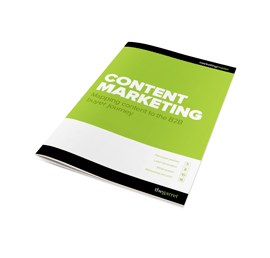 Content Marketing allows you to reach your customers wherever they are on their buyer journey. Content Marketing can be defined as a game of cat and mouse. There are other definitions. If you'd like to know more about how to maximise your investment in Content Marketing, we're happy to provide a free content audit and recommendations. Simply complete the short form below.